Bangkok (NNT/VNA) – The 2nd Thai–Myanmar Friendship Bridge across the Moei River, linking Mae Sot district in Thailand’s Tak province and Myawaddy in Myanmar has been open to traffic. Thai Prime Minister Prayut Chan-o-cha and Myanmar State Counsellor Aung San Suu Kyi presided over the opening ceremony for the friendship bridge and discussed air pollution problems. 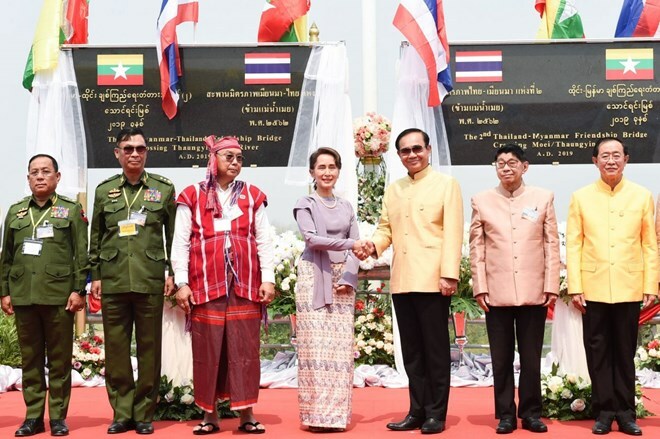 PM Prayut and Myanmar State Counsellor Aung San Suu Kyi praised the success of the project for facilitating connectivity between the two countries, following the original Thai-Myanmar friendship bridge built in 1997.